Homeopathy has a wealth of support to offer women to improve their fertility and boost their chances of trying to get and stay pregnant. Getting you in great health to maximise your chances of conceiving. To say there is a lot of stress around getting pregnant is an absolute understatement. I see women in varying stages of bringing a baby into the world. Worry and unanswered questions are a common denominator. There are many homeopathic treatments I can suggest in a consultation to maximise your chances of conceiving. Problems with fertility are complex and you may not be aware of them for some time to come. Therefore preconception care is an excellent way to boost your fertility naturally. The 3 months prior to conception are just as important as the first 3 months of pregnancy. It is a time to prepare your body for a healthy pregnancy and birth and of course a healthy baby to be. If you are ready to commit to getting in the best possible shape, physically, emotionally and mentally to help you get pregnant naturally, then Homeopathic Preconception care is an excellent way to assist your body in achieving great health and boosting your fertility. When trying to have a baby it can be hard to keep a lid on your emotions. Every month can be filled with a deep sense of disappointment, frustration and even that horrible feeling of envy when you hear that others in your circle have fallen pregnant before you. It seems so unfair at those times. And unexplained infertility can bring up a wide range of emotions including a sense of hopelessness. You’ve probably been trying for over a year and every now and then you lose confidence but it glimmers back and you keep going. Your next step may be to explore what you’ve been holding off for as long as possible – IVF treatment. If you’re currently stuck in this turmoil of not knowing if you will ever fall pregnant, please know that Homeopathy can help on so many levels. I’ve assisted many couples in this area. Often, there are other issues that are hard to uncover through conventional routes and easing those, can support the body to fall pregnant naturally. Your emotions can have a huge impact on your fertility and in homeopathy your emotional well-being is just as important as your physical health. 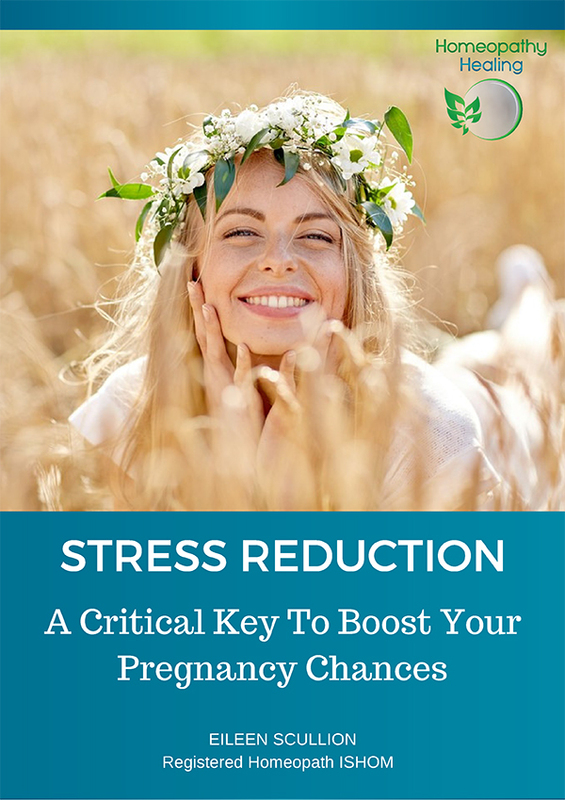 Not getting pregnant can create stress and make you feel like you have to “push” to make it happen. The more you “push” for something to happen, the more emotional and physical stress you put yourself under. In the homeopathic consultations we take a look at emotions that may be affecting your ability to get pregnant on a deeper level. For example, many women I have worked with feel frightened about becoming a mother or worry they will not be good enough. Some fear the birth itself and the pain, while others feel anxious about being pregnant and not being able to cope with the bodily changes. Women who have miscarried often fear it happening again and may not have actually got over the grief of what has happened. Women who have experienced post-natal depression may fear having to go through that all again. Some women, while desperately wanting to be a mother, worry about what losing their independence and what they will have to give up when the baby arrives. Suppressed emotions from seemingly unrelated past events may also affect your fertility. When you’ve experienced trauma in your life or been involved in an accident or emergency, or lose something or someone dear to us, this can have a huge impact on your emotional health. If you would love to learn about how Homeopathy can help you let go of possible emotional blocks , I’d be very happy to help you.